Virtual (VR) and Augmented Reality (VR) are novel techniques which provide an immersive experience to the user. Whereas in VR the real world is completely replaced for a virtual one, in AR virtual aspects are added to the real-world environment. 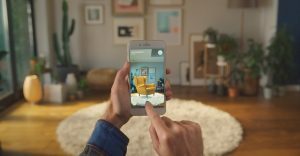 Augmented Reality enables consumers to try out (virtual) furniture in their own living room, turn their living room into a game of Minecraft, replace their TV by projecting the screen on their wall, and even virtually transport themselves to another room. This technology superimposes virtual objects (text, pictures, video, or 3D graphics) upon the physical world, via websites, smartphone applications, digital screens, or wearable devices. AR apps change the way people perceive and interact with virtual objects, because they use a real time, interactive, 3D view of the physical world, overlaid with virtual objects. 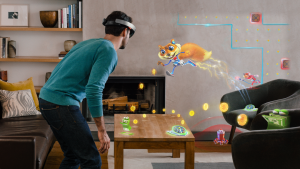 As such, AR allows consumers to interact with virtual objects as if they are real, physical objects. While AR has many different applications, one of our current research projects focuses on the persuasive possibilities and effects of AR apps and the processes that underlie these effects. Specifically, the antecedents and consequences of consumers’ use of Augmented Reality apps are studied in both informational and entertaining contexts, and with a focus on both positive and negative consumer responses. The research is part of a PhD project by Anne Roos Smink, supervised by dr. Peter Neijens, dr. Eva van Reijmersdal, and dr. Guda van Noort. The project is funded by the Amsterdam School of Communication Research (ASCoR) and a doctoral dissertation grant from the American Academy of Advertising (AAA). In Virtual Reality, users are completely immersed into the computer simulated environment: they have the perception of being present in the virtual environment and not in their actual physical environment. Due to this strong sense of presence in the virtual world, it is thought that stimuli provided in this world elicit similar responses and behaviour as in real-life. Because of this, the technique has potential as a research tool for investigating effects of (traditional) media on affective and cognitive responses and behavior, but also as a means to convey messages through a virtual-world experience. Currently, VR is used in several projects. 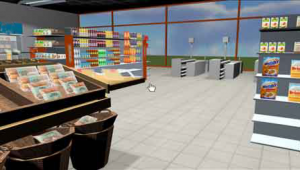 A highly immersive 3D supermarket (VirtuMart) implemented on a head-mounted display, is used as a research tool to investigate the effects of packaging complexity on purchase behavior. 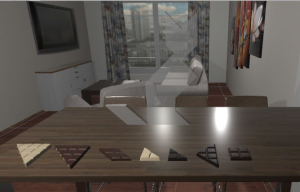 In another project, we investigate whether a VR game with exposure to virtual foods can effectively decrease food intake. Further, we investigate the effect of branded VR content on brand responses and purchase intention. Lastly, we use 360-degree movies to investigate social processes in VR. Also, dr. Nynke van der Laan has recently been awarded an NWO KIEM Creative Industries grand as PI (Put the brakes on Pac-man: Development and evaluation of a virtual reality game to decrease food intake, 2017). Smink, A. R. (2018). Using Augmented Reality to overlay branded content on the face: To what extent do type of augmentation (self/other) and use experience (active/passive) affect brand responses? To be presented at the AAA annual conference, New York, United States. Smink, A. R., van Reijmersdal, E. A., van Noort, G., & Neijens, P. C. (2017). When virtuality becomes reality: Three underlying processes that explain persuasive consequences of augmented reality apps. Presented at International Conference on Research in Advertising, Ghent, Belgium.